"There has been quite a buzz around this unique advancement in space, and the valuable data it will provide on methane, a powerful greenhouse gas that accounts for a quarter of the warming our planet is experiencing today. Curbing anthropogenic methane emissions is one of the most efficient and economical options available to slow the rate of warming over the next few decades, while efforts continue to reduce CO2 emissions worldwide." The Environmental Defense Fund (EDF) is planning to be the first environmental group to send its own satellite into space. "This year has been an unequivocal disaster for the future of the planet. President Donald Trump has managed to take a wrecking ball to years' worth of hard work and painstaking negotiations. If not undone, our retreat from the Paris Climate Accords and the EPA's Clean Power Plan alone mean our planet's temperature will rise at a greater rate and our citizen's health will degrade. Other changes in environmental regulations on drilling and auto and appliance efficiency will only make matters worse." Perhaps the thing that worries me the most is the massive deforestation underway in areas like Asia and Latin America. Countless trees and millions of square miles of jungle and forest have been removed to accommodate our desires for more -- more wood, more farmland, more pasture, more meat. When I first looked down upon the Amazon rainforest in 2001, I saw vast areas of jungle and a wide and winding copper colored river that went on and on and on. A river that was impossible to miss and like no other on the planet. By 2011, however, the part that was most noticeable wasn't the river or the jungle but the large swaths of empty land. From space, it looks empty because we are far away. We don't see the crops or the cattle but we do see the loss. We see the loss of an incredibly diverse ecosystem that once held endless possibilities for new medicines and other discoveries. We see the loss of a home for so many species that will now have to learn to adapt and survive somewhere else -- or not. And we see the loss of a large amount of carbon, sequestered in a living and breathing ecosystem which created massive amounts of oxygen for all of us. That carbon, once the giver of life to millions of species all over our planet, now has a new role: greenhouse gas. It will sit in our atmosphere as CO and CO2 for millennia, but in this case as an invisible blanket, warming our planet, changing our climate and creating a cataclysmic mess for future generations. The rapidly growing abundance and sophistication of satellite imagery and remote sensing data is about to change (the scientific fields of earth science)... thanks to a profusion of startup companies, including Planet, DigitalGlobe, Skybox Imaging (later purchased by Google and renamed Terra Bella), Urthecast, and LAND INFO Worldwide Mapping. The proposed NASA budget targets the agency’s work on environmental science, cutting funding for Earth science research grants. The cuts would go further by eliminating several missions that are in development, including PACE (Plankton, Aerosol, Cloud, ocean Ecosystem), which is intended to monitor and provide baseline data of the Earth’s ocean and their health; the Orbiting Carbon Observatory 3, or OCO-3, an instrument to precisely monitor the carbon dioxide in our atmosphere, continuing the unique work of OCO-2; and the Climate Absolute Radiance and Refractivity Observatory, or CLARREO, pathfinder, which is to use a solar spectrometer to produce highly accurate climate projections. @NASA Dr. David Crisp: "You can manage only what you can measure"
"New Definitions of National Security"
GreenPolicy360: The election of Donald Trump as US president delivers immediate crisis and a turning point. The president-elect's statements that climate change is a 'hoax' and environmental policies and programs, including NASA 'Earth Sciences', are impediments that need to be ended now assures tumult and a new level of threat to national and global security. Announced administration appointees, as of November 2016, and recent Congressional threats to deeply cut environmental protection and NASA 'Earth Science' budgets are warning signs of coming showdowns over the direction of the nation and the nation's priorities. NASA scientists responsible for vital programs have been reluctant to speak publicly since the election but one anonymous NASA scientist is among the first to write online about the value of earth science research from space. Anon: "We are the largest combined organization of scientists and engineers in the world dedicated to space-based observations of Earth, the Solar System, and the Universe. A huge part of our mission is to design and fabricate Earth-viewing satellites that track long-term changes in topography and climate. These satellites ensure that we have the most complete set of data available to not only predict how humanity's impacts will affect the Earth, but also understand how we can prepare and protect those most vulnerable to climate change and rising sea levels. As an example of our impact on the daily lives of people around the world, one of the satellites I previously worked on, Global Precipitation Measurement, is currently in Earth orbit tracking extreme weather events. Its data allows meteorologists to improve their forecasts of where hurricanes will strike and how intense they will be, as well as to identify the areas that are most prone to floods and landslides, so that we can give advanced warnings to those affected. This is just one of dozens of major Earth-observing satellites that NASA manages everyday. "Today, we were shocked to hear of Trump's plan to scrap NASA's climate change research as part of a crack down on "politicized science". Among the scientific community, climate change is no more "politicized science" than the theory of gravity is. While his crackdown would mean that thousands of scientists and engineers at NASA Goddard would lose their livelihoods, it represents an even greater loss for the world. Without data continuity in our Earth observations, we will be blind to the ravages of climate change: to the deluges and droughts that might devastate crops, to the extreme weather events that destroy communities as the Earth continues to warm. We will not be able to develop the solutions that can prevent Earth's temperatures from rising to catastrophic levels. I urge you to implore your Congressional Representatives to not allow Trump's plan to happen. We cannot sit on the sidelines over the next four years: our future on this planet is at stake." One Case Study of the Mentality -- H.R/637 / 115th Congress "Stopping EPA Overreach Act of 2017"
Under Trump, Will NASA’s Space Science Include Planet Earth? Speaking directly to threats to the value of earth science and earth science research from space, Governor Brown addressed the American Geophysical Union (AGU) Fall Meeting in California. The AGU annual gathering is the largest Earth and space science meeting in the world. The AGU is an international scientific society that describes itself as "dedicated to promoting discovery in Earth and space science for the benefit of humanity." "Well, I remember back in 1978 I proposed a LANDSAT satellite for California. They called me 'Governor Moonbeam' because of that. I didn't get that moniker for nothing. "And if Trump turns off the satellites, California will launch its own (d-mn) satellites!" "Vital Signs of the Planet"
"Earth Right Now, Vital Signs"
"Watch 25 years of Arctic Sea Ice disappear"
Since its launch in 2006, CALIPSO has orbited the Earth tirelessly, using its lasers to take more than 5.7 billion lidar (light detection and ranging) measurements probing the vertical structure and properties of clouds and other particles — such as dust, sea salt, ash and soot — in the air. For atmospheric scientists, the ability to regularly and accurately examine clouds and particles at different heights was something new. Gathering that data over such a long time period has contributed to a scientific bonanza. Also, scientists are able to combine CALIPSO’s measurements with those of other Earth-observing satellites circling the globe in a cooperative path called the A-Train constellation. CALIPSO and CloudSat, a satellite containing a cloud-profiling radar, launched together on a Delta II rocket, now fly in formation with satellites named Aqua, Aura, Global Change Observation Mission-Water (GCOM-W) and Orbiting Carbon Observatory (OCO)-2. Combining measurements from these A-Train satellites offers a clearer view of what’s happening in the atmosphere. “CALIPSO, in complement with the other instruments flying in the A-Train, has provided observations in areas that had never been observed before,” said Pierre Tabary, program manager for atmosphere, meteorology and climate for CNES, the French space agency. He said scientists have gained knowledge about clouds, and their impact on incoming solar radiation, as well as on infrared radiation coming from the Earth’s surface, known as the greenhouse effect. More than 1,600 scientific and technical reports and published research papers have used CALIPSO data. The data are widely cited in reports from the Intergovernmental Panel on Climate Change", Tabary said, "a clear demonstration of what CALIPSO has brought to climate science." DSCOVR is launched and on its way! 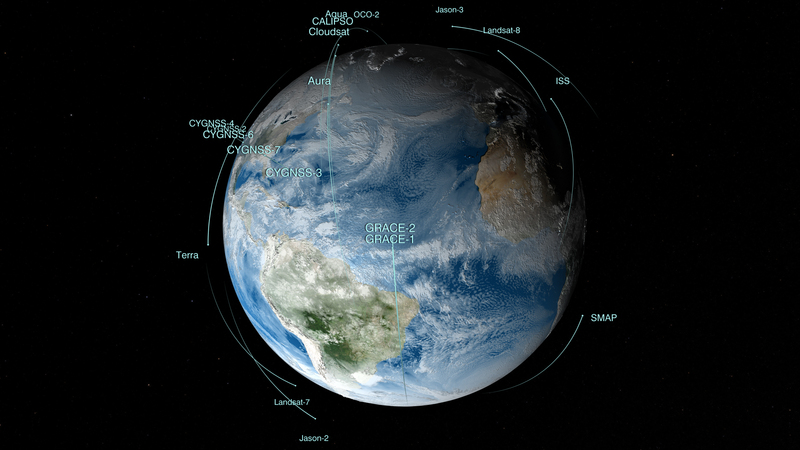 February 12, 2015 The DSCOVR satellite with its EPIC cam, PlasMag & NISTAR instrument package is on the way... a million mile journey, scheduled to light up, be tested and begin delivering data to Earth in August, including near-real-time imaging of Earth provided online – We will be delivering a stream of amazing imagery of our planet as NASA/NOAA begin uploading EPICs pictures of us! As we have been recalling the history, we haven't had returned to us a 'whole earth' image since 1972. Today, Feb 10, the Associated Press reports Sen. Bill Nelson, D-Florida, pointing out from Washington that there hasn't been a full, sunlit picture of the Earth since Apollo 17 in 1972 - NASA's last manned moon-landing mission. Subsequent images have been stitched together, the Senator explained, for composite shots. The Senator has an exceptional point of view as he was an astronaut -- In January 1986, Nelson spent six days orbiting Earth as a payload specialist aboard space shuttle Columbia. His NASA bio adds "The experience gave him a new perspective on the Earth’s fragile environment and a greater appreciation of the importance of our nation’s space exploration program." The DSCOVR satellite launches into deep orbit with multiple missions -- to monitor space weather and, due to the satellite's orbital distance from Earth (1 mil miles), DSCOVR will be sending back daily images of the 'whole earth' via its EPIC image-taking system and via its NISTAR system measuring earth's earth's temperature, our "radiation balance" ("albedo"). #Earth360, scientific leap forward with the soon-to-launch Soil Moisture Active Passive (SMAP) platform"
Launching Jan 29, 2015 to "measure the moisture in Earth's soils with unprecedented accuracy and resolution. First full set of CO2 data made available in March 2015 for scientists and public to download and explore. According to JPL scientists: "Where OCO-2 really excels is the sheer amount of data being collected within a day, about one million measurements across a narrow swath... For fluorescence, this enables us, for the first time, to look at features on the five- to 10-kilometer scale on a daily basis." 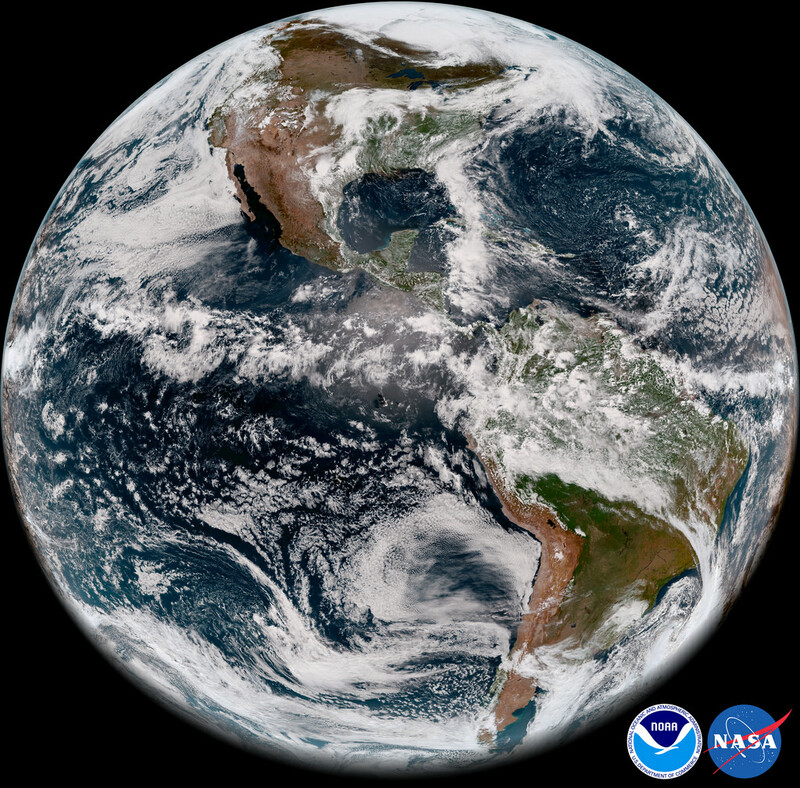 SIF can be measured even through moderately thick clouds, so it will be especially useful in understanding regions like the Amazon where cloud cover thwarts most spaceborne observations." 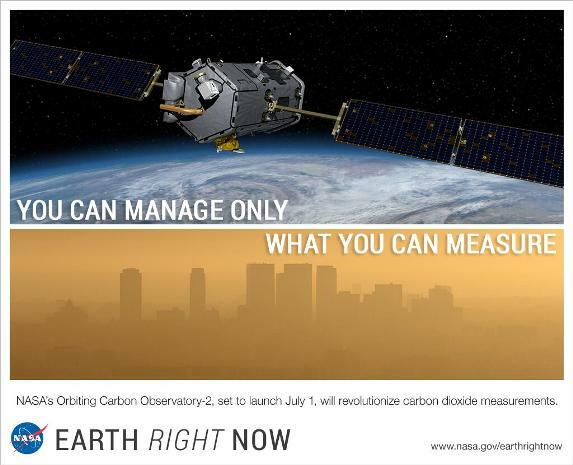 The changes in atmospheric carbon dioxide that OCO-2 seeks to measure are so small that the mission must take unusual precautions to ensure the instrument is free of errors. For that reason, the spacecraft was designed so that it can make an extra maneuver. In addition to gathering a straight line of data like a lawnmower swath, the instrument can point at a single target on the ground for a total of seven minutes as it passes overhead. That requires the spacecraft to turn sideways and make a half cartwheel to keep the target in its sights. 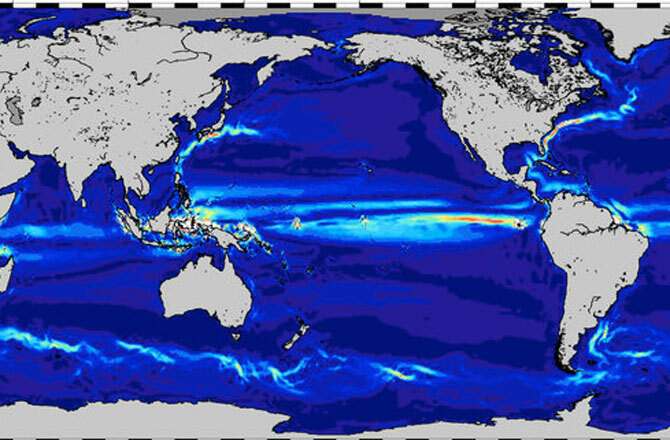 The targets OCO-2 uses are stations in the Total Carbon Column Observing Network (TCCON), a collaborative effort of multiple international institutions. TCCON has been collecting carbon dioxide data for about five years, and its measurements are fully calibrated and extremely accurate. At the same time that OCO-2 targets a TCCON site, a ground-based instrument at the site makes the same measurement. The extent to which the two measurements agree indicates how well calibrated the OCO-2 sensors are. Additional maps released recently showed the results of these targeting maneuvers over two TCCON sites in California and one in Australia. "Early results are very promising," said Paul Wennberg, a professor at Caltech and head of the TCCON network. "Over the next few months, the team will refine the OCO-2 data, and we anticipate that these comparisons will continue to improve." 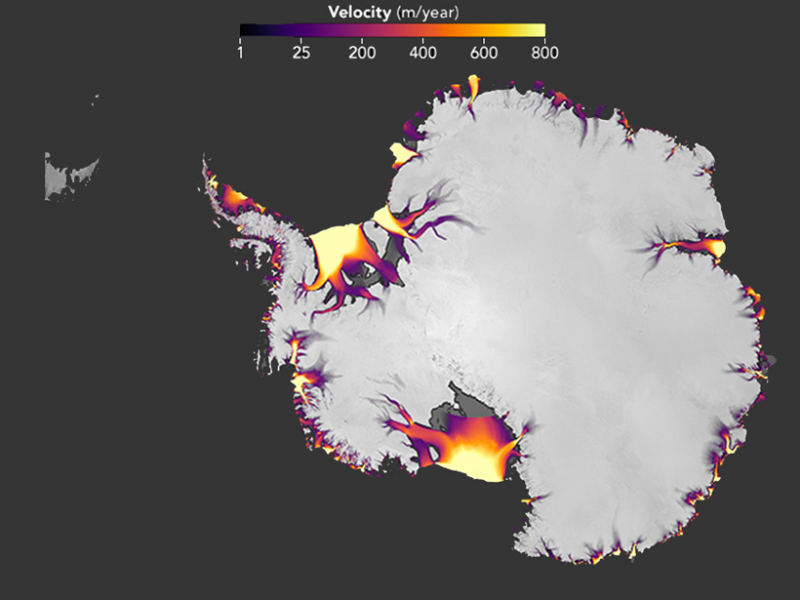 Scientists produce "the most accurate space view yet of global ocean currents and the speed they move..."
The Arctic Ice Is Melting: Why? Scientists estimate that five times as much carbon might be stored in frozen Arctic soils — permafrost — as has been emitted by all human activities since 1850. This worries people who study global warming. While emissions from permafrost currently account for less than 1 percent of global methane emissions, some researchers think this could change in dramatic ways as the world warms and that carbon-rich frozen soil breaks down. 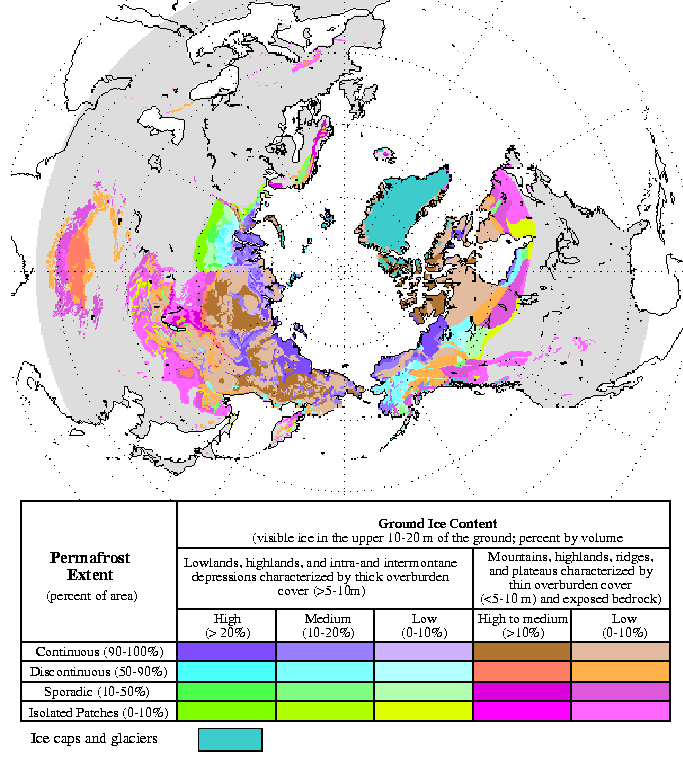 The map above, based on data provided by the National Snow and Ice Data Center, shows the extent of Arctic permafrost. Any rock or soil remaining at or below 0 degrees Celsius (32 degrees Fahrenheit) for two or more years is considered permafrost. Continuous permafrost, which occurs in the coldest areas, refers to areas where frozen soil underlies more than 90 percent of the surface. Discontinuous permafrost occurs in slightly warmer areas, where frozen soils underlie 50 to 90 percent of the surface, while certain features such as rivers and south-facing slopes may be ice-free. In areas with sporadic permafrost, frozen soils underlie 10 to 50 percent of the surface. In areas with isolated permafrost, frozen soils underlie less than 10 percent of the surface, usually only occurring in depressions or north-facing slopes. Using statistically modeled maps drawn from satellite data and other sources, U.S. Geological Survey scientists have projected that the near-surface permafrost that presently underlies 38 percent of boreal and arctic Alaska would be reduced by 16 to 24 percent by the end of the 21st century under widely accepted climate scenarios. Permafrost declines are more likely in central Alaska than northern Alaska. 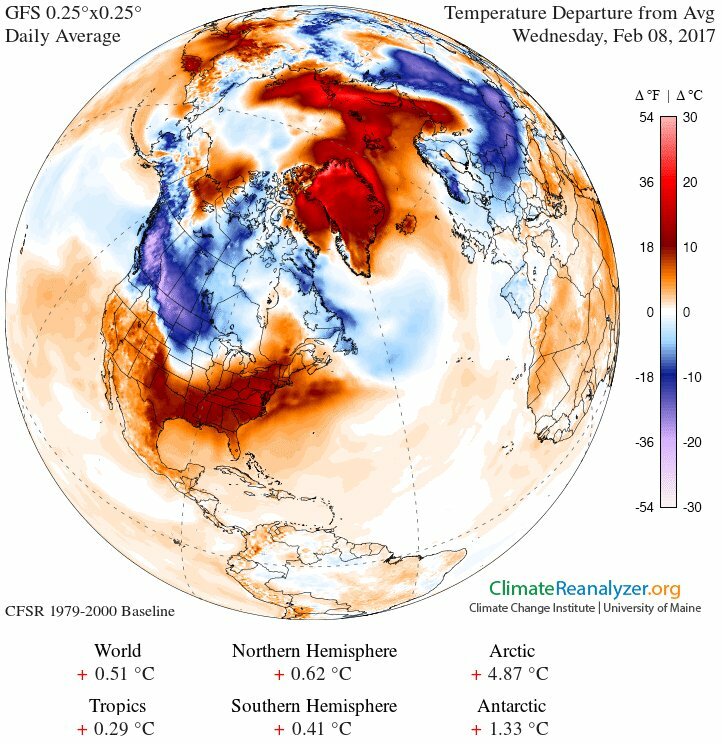 Northern latitude tundra and boreal forests are experiencing an accelerated warming trend that is greater than in other parts of the world. This warming trend degrades permafrost, defined as ground that stays below freezing for at least two consecutive years. Some of the adverse impacts of melting permafrost are changing pathways of ground and surface water, interruptions of regional transportation, and the release to the atmosphere of previously stored carbon. Arctic temperatures are expected to increase at roughly twice the global rate. The Intergovernmental Panel on Climate Change (IPCC) will in their fifth report establish scenarios for the future, where the temperature in the Arctic will rise between 1.5 and 2.5°C by 2040 and with 2 to 7.5°C by 2100. Estimates vary on how many tons of greenhouse gases are emitted from thawed permafrost soils. One estimate suggests that 110-231 billion tons of CO2 equivalents (about half from carbon dioxide and the other half from methane) will be emitted by 2040, and 850-1400 billion tons by 2100. This corresponds to an average annual emission rate of 4-8 billion tons of CO2 equivalents in the period 2011-2040 and annually 10-16 billion tons of CO2 equivalents in the period 2011-2100 as a result of thawing permafrost. For comparison, the anthropogenic emission of all greenhouse gases in 2010 is approximately 48 billion tons of CO2 equivalents. Release of greenhouse gases from thawed permafrost to the atmosphere may increase global warming. 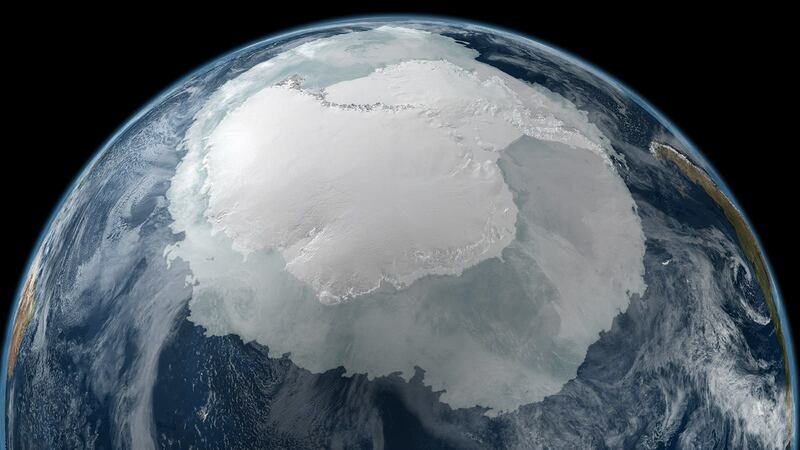 Melting / New assessments of impacts of global warming come from Europe's Cryosat spacecraft. To benefit citizens "asking for a better quality of life on earth... for greater security and economic wealth... to pursue dreams, to increase knowledge... for younger people to be attracted to the pursuit of science and technology... ESA's purpose shall be to provide for, and to promote, for exclusively peaceful purposes, cooperation in space research and technology and space applications, with a view to their being used for scientific purposes..."
"It's All Connected": Small to Large"
Phytoplankton are essential ecosystems of the seas. They are floating, drifting, plant-like organisms that harness the energy of the Sun, mix it with carbon dioxide that they take up from the atmosphere, and turn it into carbohydrates and oxygen. Scientific estimates speak of approximately half the oxygen in the Earth's atmosphere being the result of plankton photosynthesis and phytoplankton are critical to the marine food web, being the primary producers of food in the oceans, from phytoplankton to zooplankton to fish and shellfish to whales. Like plants and trees on land, "phytoplankton give us a lot more than food". Whether the current science estimates that 50 or 80 percent of the oxygen in our atmosphere has been produced by phytoplankton, the health of the blue-green ocean life is essential for sustainable ocean ecosystems. The tiniest of living organisms exert an outsized influence on the planet. 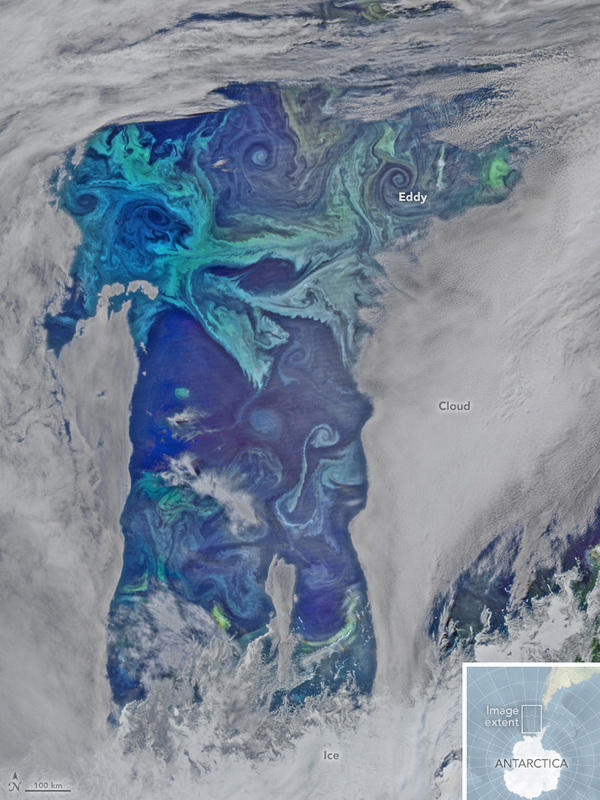 A decline in ocean mixing due to warming surface waters is to blame for that phytoplankton plummet, researchers propose online January 19 in Geophysical Research Letters. The mixing of the ocean’s layers ferries phytoplankton nutrients from the ocean’s dark depths up into the sunlit layers that the mini plants inhabit. The loss of these microbes, which form the foundation of the ocean food web, may undermine the region’s ecosystem, warns study coauthor Raghu Murtugudde, an oceanographer at the University of Maryland in College Park. "A single kind of blue-green algae in the ocean produces the oxygen in one of every five breaths we take"
This page was last modified on 9 April 2019, at 17:35. This page has been accessed 61,941 times.